The natural charm of this ancient Perigordine stone farmhouse that dates back to 1450 will provide the perfect restful retreat for your holiday in the beautiful Bouriane countryside (South West Lot). The house is built in the local warm, golden coloured stone, and is situated in the hamlet of Le Coustalou, on the edge of the small village of Marminiac and only 3 kilometres from Cazals. The house is spacious with a 6 x 8 metre living area and five large double bedrooms, two with en-suite bath/shower rooms, set over three floors with a third shower room on the second floor and a separate wc on the first floor. 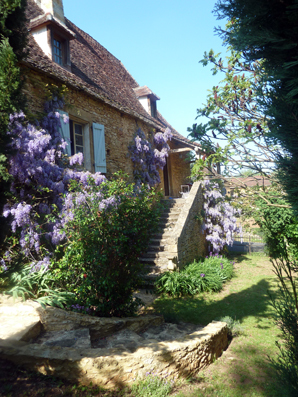 The property has been beautifully renovated, and has not lost any of it's original character. The traditional stone, shuttered windows and old terracotta and chestnut floors have been combined with crisp white bed linen and fine French and English antiquities. It has the benefit of gas fired central heating with underfloor heating on the first floor and is, therefore, available for winter lettings. Logs are also supplied, during the colder months, to enable guests to enjoy open fires in the huge fireplace. Le Coustalou has grounds extending to 4 acres with a 5m x 10m salt filtration swimming pool with roman steps and external south facing paved terrace adjacent to the pool. Extensive lawns with shaded areas are ideal for children to play, opening up to a large field and beyond, woodland with beautiful walks.